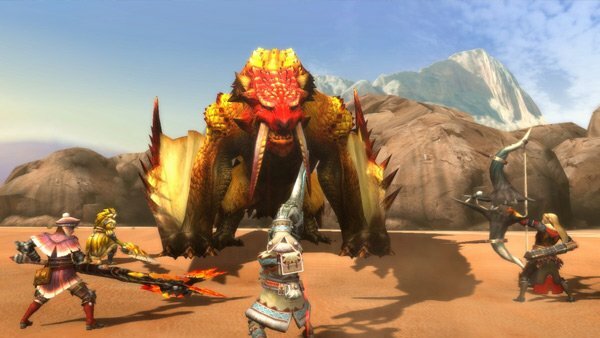 Monster Hunter 3 Ultimate offers a ton of playtime and some good presentation, but various gameplay and control issues, along with a lack of online on the 3DS, hurt the overall package. 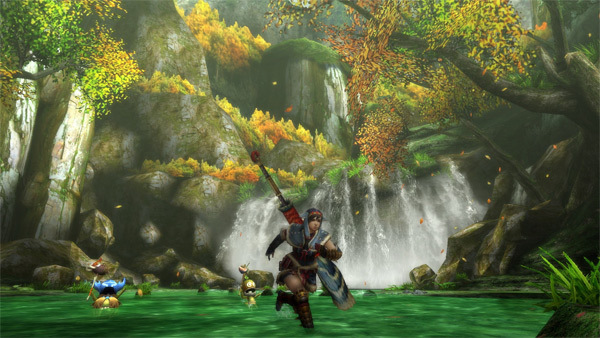 The Monster Hunter franchise, originally established in 2004 on the PlayStation 2 by Capcom, has been a license to print money in its home country of Japan for some time now. While Capcom has brought many entries in the series overseas, it’s never truly caught on the same way. This isn’t stopping the company from putting out the latest entry though in the form of Monster Hunter 3 Ultimate, an enhanced Wii U and 3DS port of the 2010 Wii entry Monster Hunter Tri. In it, players will find a lot to do, but at the cost of some clumsy controls and a slow buildup, it may not be for everyone. Players create a custom avatar, choosing from different hairstyles, clothing and body colors, and even different voices for the various grunts their player will make in battle (There’s no proper in-game voice acting). From there, they start their journey in an island village troubled by recent earthquakes, presumably caused by one of many monsters that populate the land. After a brief tutorial, players can take on several different quests that involve everything from straightforward monster hunting to fishing and mining for minerals, eventually opening up new environments to explore outside of the initial island. Though the actual plot is light, props should be given to whoever handled the English translation of the dialog for everyone you run into. It has tons of personality and genuine humor, and may surprisingly be one of my favorite aspects of the game. It also helps that as time progresses, you’ll find plenty of things to do in the villages you rest in between quests. These include purchasing and selling items and equipment, trading with merchants, growing crops, and even unlocking decorations for your room. The game is no slouch when it comes to delivering a deep and lengthy experience. The downside to this is the fact that it does take some time to get to the more engaging quests. Earlier quests involve very simple and straightforward tasks, and though that’s certainly normal for a game like this, the amount of them here feels a little bit too much. Even when I was several hours in, one of the first quests for a new environment consisted only of letting me explore it at my own leisure and end the quest at any point. It was a nice way of easing me into the new level, but it also felt a bit too much like padding. You’ll find yourself picking up plenty of items during each mission, each with their own purpose and function. You can find plants and ore strewn throughout each environment, and even harvest body parts from monsters you’ve slain. You can also fish, mine, and grab insects, among other side tasks. Again, there is a lot of content here. The main problem is that it’s far too easy to fill up your limited item pouch very quickly. Thankfully, in between missions, you’re able to deposit whatever you want into an item box with much more room, but I still found myself running into frustrating situations where I picked up an item critical to my current quest and had to discard something else first. It also doesn’t help that some of the combat can feel like a chore. This is a bit hard to explain, but for many of the weapons you’ll obtain, pressing one of the attack buttons makes your character appropriately carry out an attack animation. The problem is that you are completely unable to move your character during this, so if you miss, you’re an open target for a moment. It’s a mechanical problem that grows more annoying over time. In terms of graphical presentation, the 3DS version does an overall nice job. While not extremely colorful, the environments look solid and belivable, and the monster designs and animations are quite creative and lively, especially when some of them are introduced via brief cinematics. The use of the handheld’s 3D is mostly unspectacular (The only time I really marvelled at it was when I stood behind a cloud of smoke), but I chalk that up due to the original game not being made with that in mind, which is forgivable. The game supports multiplayer for up to 4 players to cooperate on quests. In an unfortunate omission, the 3DS version of the game lacks online play. While this is probably more forgivable in Japan, where it’s likely a lot easier to find someone with a copy of the game, that’s not the case here. As a result, I was unable to try the multiplayer component of the game, though I understand the Wii U version does support online, as well as a future download enabling save syncing between the two consoles similar to Sony’s Cross Buy feature on the PS3 and Vita. Monster Hunter 3 Ultimate is very competent in terms of how much playtime you can get out of it, but several issues pile up and prevent it from being the truly fun experience it could have been. With some minor tweaks, future entries in the series could be truly great, but what’s here is ultimately just decent. This review is based on a 3DS copy of the game that was provided to us for review purposes.